Halloween is just around the bend on Wednesday, October 31. This is a big month for marketers looking to capture sales by following the latest Halloween marketing trends. With access to deep shopper data across our retailer network, Criteo started to look for the most popular search terms on retail sites during the month of October. If you’re a marketer, you already know how important it is to build your seasonal campaigns early to capture the most sales – especially for Halloween, when shoppers plan out in advance what they’re going to buy for the big day. To help you prepare, we looked at Halloween marketing trends from 2017 to figure out what we could expect to see in 2018. To shed light on seasonal shopping trends, we looked at US searches from some of the top US advertisers leveraging Criteo Sponsored Products’ data. The research, which encompasses October 1-25, 2017, points to several interesting candy and costume trends. When it comes to sweets, chocolate dominated, with 5x more searches than the next most-searched-for candy: fruit snacks. Gourmet brand Lindt topped branded chocolate searches, while classics like M&Ms, Reese’s, and Twix were also solidly represented. As far as costumes, 2017 Halloween-goers were on the hunt for Unicorn attire, which received 60% more searches and the next terms, Disney and Descendents. Moana and Wonder Woman topped the list of character costumes. 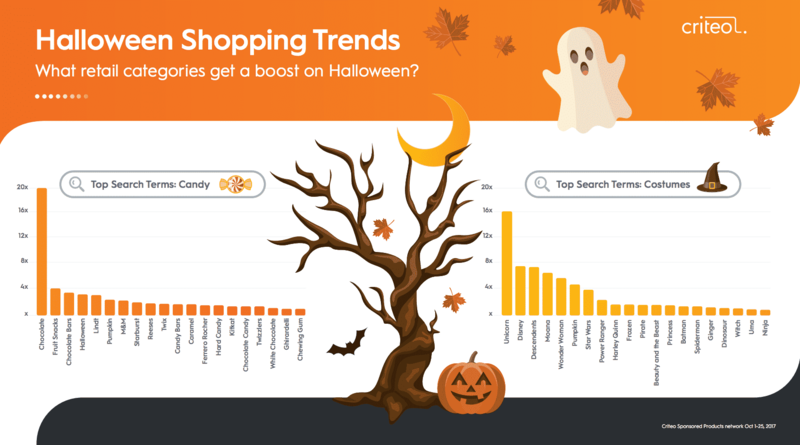 To unpack Halloween shopping behavior and identify seasonal opportunities, we looked at which categories peaked and when. Sales at Mass Merchants peak (+64%) a week before Halloween. Last year, we saw online sales from Mass Merchants start to increase slowly but surely starting three weeks before the holiday. Sales uplift was highest a week prior to Halloween, at +64%. Toys and Gadgets sales spike (+63%) the day before Halloween. Data from 2017 shows a 63% uplift in sales of Toys and Gadgets on October 30. Sales lowered on Halloween itself but recovered quickly in the days after when many retailers started promoting their Black Friday deals in the run-up to Thanksgiving. Sales of both apparel and jewelry/accessories jump throughout October. The weeks leading up to the holiday also present opportunities for certain sub-verticals, depending on the relevance of their products. 2017 data reveals a 29% uplift in online sales of both apparel and jewelry/accessories in the weeks before Halloween. The Takeaway? Start your Halloween marketing early for the most sales. Our research shows that Halloween revelers start purchasing several weeks ahead of the holiday. By leveraging Criteo solutions, you can ensure that you’re taking advantage of shopper interest (Criteo Sponsored Products), and not losing potential customers when they leave your site (Criteo Dynamic Retargeting). As the big night approaches, you’ll be primed for the most sales as shoppers go all out with last-minute Halloween buys. 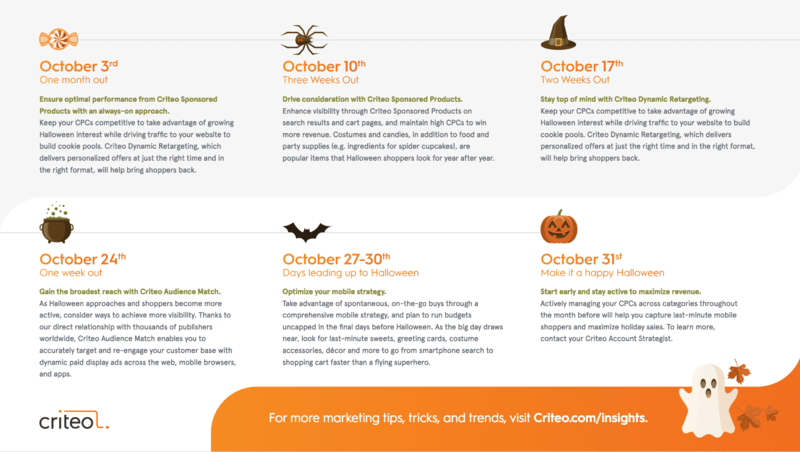 Learn more about how to make the most of your marketing efforts with the full Halloween research here. **Indexed online daily sales in the US. Baseline equals average daily sales index of 100 from Jan 2-8, 2017.